We’ve been busy here at NOTCOT tweaking and building and designing secret things we’re rolling out as they become ready ~ live testing and debugging ~ silly things like that… one of them you may have noticed over at Tasteologie - special featured* posts (which used to only link here to NOTCOT.com) may sometimes lead you to special posts within the various grid sites (Tasteologie is the first i’m experimenting with this on! )… so far you can see things like the heart shaped eggfruit, Top Chef Tiffany Derry’s dinner in St Croix, and even a video of drinking coconut water with a papaya straw! More to come, constant work in progress as always! The latest? 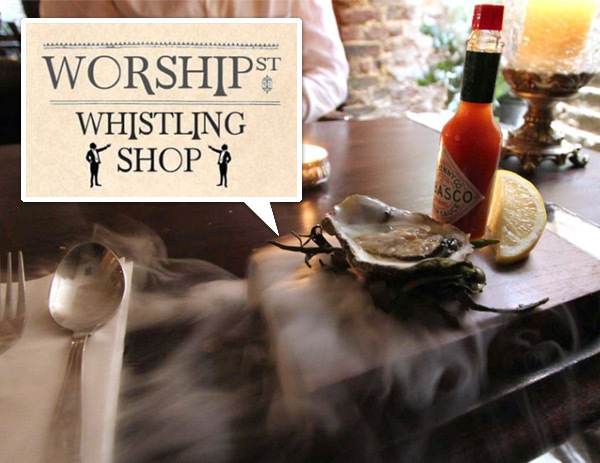 Justine went and checked out the adorable, hidden, Victorian Worship St Whistling Shop - tasting all kinds of delights, playing with the jasmine mist poured on oysters, exploded vodka martinis, jenga like stacks of hand cut chips, and more! The decor and settings are gorgeous as well! Love the lamp post INSIDE even!